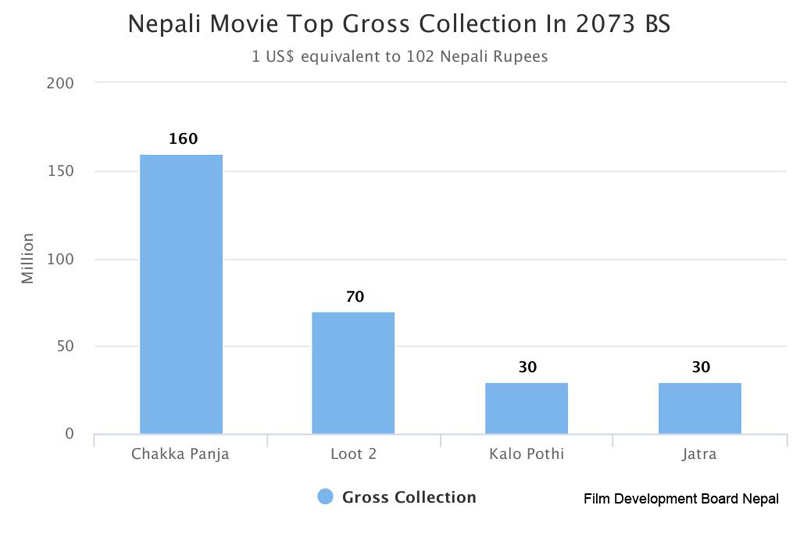 KATHMANDU – In the year 2073, 86 Nepali movies were released from Baishak 10 to Chaitra 25. The most popular forms of entertainment, is continuously growing with large investment on movie making process in Nepali movie industry. This year comedy and satirical movie 'Chakka Panja' broke all the records of net gross collection of Nepali movie with Rs. 160 million. Likewise, the sequel of 'Loot' – 'Loot 2' collected Rs. 70 million net gross. The story based on two boys looking for their missing hen in the midst of Maoist insurgency 'Kalo pothi' earned around Rs. 30 million net gross collection with various international awards including critic award in Venice Film Festival . Black comedy drama featured movie, 'Jatra' also collect net gross collection around Rs. 30 million with international film festival screenings. Deepak Rauniyar's White Sun (Seto Surya) got international success. The movies also received good international reviews & won international award as well. However, the movie could not attract Nepali viewers and was proved disaster in Nepal. The movies 'Purano Dunga', 'Gajalu', 'How Funny', 'Jhumki', 'Love Sasha' & 'Lappan Chappan' couldn't gain success. The year 2073 saw exploration of new genres in Nepali movie. The largest box office collected movie's stories focused on local traditional Nepali society. Many movies put on their effort to reflect the Nepali culture and tradition except few that could not even portrait the actual theme. Perhaps some Nepali movie tried to promote ultra- modernization, westernization, urbanization, new way of lives, a sense of pan-Nepali, secularization the liberation of women and rights of minorities and in particular the relationship between high caste and low caste system. 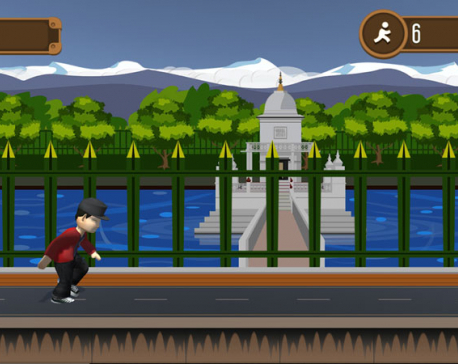 Even in aspects of fashion and trend, aided by magazines, entertainment portal had played influential role in Nepali society which have generated discussions and sensitize public opinion on issues like drugs and violence as well. Movies are powerful media of entertainment. It helps to transform the viewer's understanding of reality, decision and policy makers, potential investors, media representatives and ordinary audiences who have an alternative impression of the life and culture of Nepal. Movie director Navin Subba says, adding that the selection of the movie of the audience differ with the actual theme of the movie. Nobody succeed to survive in the audience expectation. Unsuccessful history of Nepali cinema is clearly associated with audience’s state of mind. It shows that Nepali film producer and director failed to draw audience to cinema hall. In many cases they are have failed to capture their emotions largely, though they were much aware the demand of the viewers. Still Nepali film industry is struggling to get its position among the local audience. Large number of people is still beyond the frame of Nepali movie. 'Repetitive theme of story, lack of creativity and distributor oriented filmmaking would not survive for long time. But people from industry are seem unaware from this fact and repetitively using cliché formula oriented movie that had already retired in Bollywood film industry', says producer Pradip Udaya . He also mentions that some movies that do not have good storyline but are enjoyed by audiences. Across the country there are almost 200 cinema hall that put on show Nepali movies.